Cristiano Ronaldo plays his first competitive game in Turin on Saturday as it was revealed that his arrival at Juventus has pushed the Serie A champions over the billion-euro mark on the Italian stock exchange. According to Calcio e Finanza, a specialist sport and finance website, at the close of business on Friday, Juventus were valued at 1.035 billion euros ($1.2 billion). It is the first time the club has reached that level since its introduction on the stock exchange in 2001. That compares to Manchester United, the world's richest club, whose overall value is £3.1bn ($3.9 billion). Juventus's shares have grown 55.15 percent on the stock exchange since July 1, increasing from 0.660 euro to 1.024 euros. "The rise peaked this summer, starting in June, when the first information about the possible arrival of Cristiano Ronaldo began circulating," noted Calcio e Finanza. The five-time Ballon d'Or winner joined the Serie A champions from Real Madrid on July 10 in a 100-million-euro deal. He earns a salary of 30 million euros per year. Since his arrival sales of the club's black and white jersey have also exploded. Calcio e Finanza added that the volume of share sales went from 19 million euros in June to 301 million euros in July. 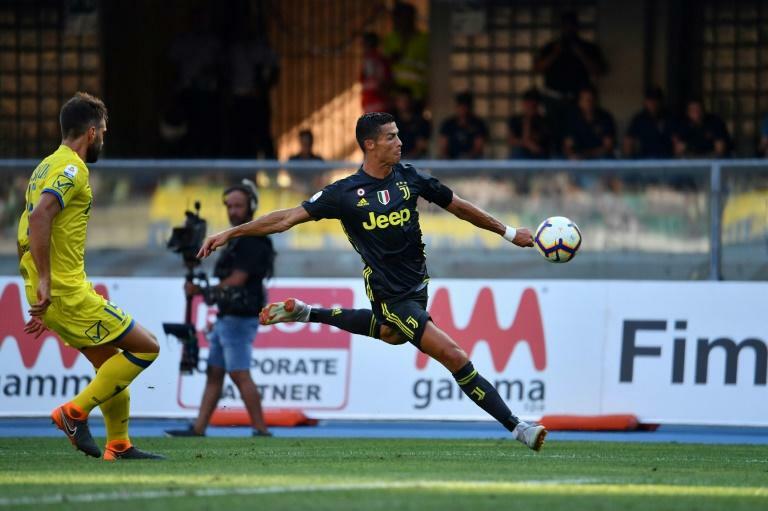 Ronaldo played his first competitive game in a 3-2 win against Chievo in Verona last weekend. His first game in Turin is against Lazio on Saturday at 1600 GMT. "There's excitement in the air!" said Juventus coach Massimiliano Allegri. "Ronaldo is bringing a great enthusiasm to Italian football, I see all the people that are waiting outside, but regardless of the excitement, we still have to win games. "We haven't won anything just by signing him, so we have to show that on the pitch. "Lazio will make it a great encounter, they defeated us last season at Allianz Stadium to end a 41-game unbeaten run. So it's very important, even if it is only our second match of the season." Simone Inzaghi's Roman side -- who finished fifth last season -- lost their opening match of the season 1-0 against Napoli. "It would be wrong to only think about Ronaldo," said Inzaghi. "They'll also play (Paulo) Dybala and (Mario) Mandzukic, and they have so many alternatives on the bench."